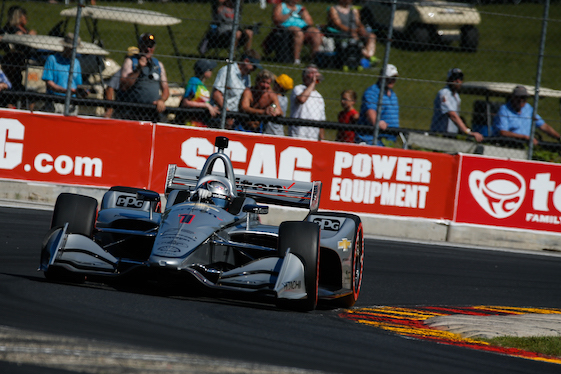 Josef Newgarden continued to be the driver in control at Road America this weekend as he followed up his quickest practice laps on Friday with a pole victory on Saturday. The Team Penske driver won the pole for the IndyCar Series event with a lap at 140.020 mph at the 4-mile, 14 turn natural road circuit in Elkhart Lake, Wis.
Second fastest in qualifying was Newgarden’s teammate, Will Power. His fast lap was at 139.054 mph. It will be Power’s fourth consecutive front row start. Bot Penske drivers were in Chevrolet-powered cars. The next seven fastest drives – led by Ryan Hunter-Reay of Andretti Autosport – were in Honda-powered cars. Hunter-Reay’s fast lap was at 139.778 mph. Right behind Hunter-Reay was teammate Alexander Rossi. “We can do a lot from fourth,” Rossi said. “It’s always disappointing when you lead your two groups and miss out on the pole, but it’s so close. It’s amazing that around a four-mile track, it’s so tight.